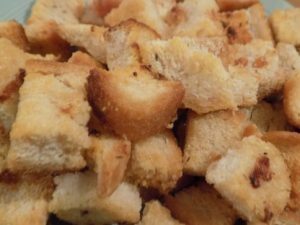 Garlic Croutons – Create, Make & Bake! 60 ml (1/4 cup) olive oil + a bit extra for the baking tray. 1. Put a bit of plain olive oil in the bottom of the baking tray and make sure at least most of it is covered. 2. 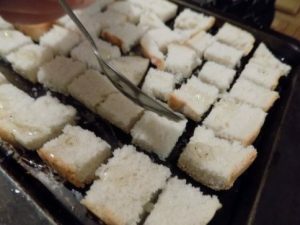 Cut the bread into equal chunks, really whatever size you want. 3. Mix together in a small bowl (doesn’t have to be small) the the olive oil, garlic puree and thyme. 4. Lay the bread on the tray packed close together. Drizzle the garlic oil mixture over the bread as well as sprinkle the salt over them all, make sure everything covered. 5. Spread out the bread as much as possible. Bake in the oven gas mark 5 (373*F/190*C) for 5 minutes, take it out and turn them over. 6. Every 5 minutes check on them and turn them until golden brown. 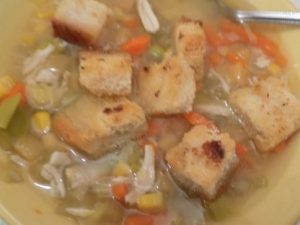 Pingback: Chicken and Veggie Broth – Create, Make & Bake!